Happy July everyone! I cannot believe June has already come to an end!!! Lucy will be SIX months old in a little less than 2 weeks! Life feels crazy. Anyway, here are some of the things I've been really loving this past month! 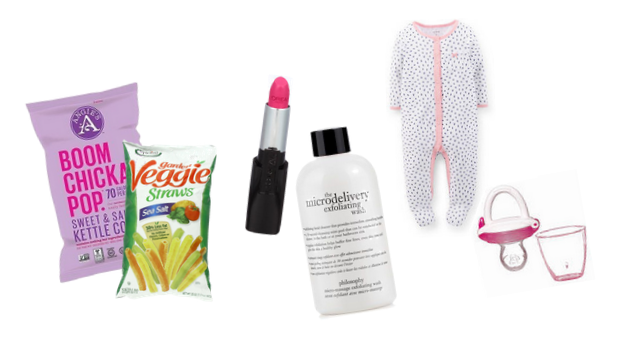 It's a grab bag mix of food, beauty, clothing and baby stuff. Check it out! Angie's Boom Chicka Pop Sweet & Salty Kettle Corn // If you love kettle corn as much as I do, you will die for this stuff! Nothing beats a fresh bag of kettle corn from the fair (or Sunday flea market if you live in the Wentzville MO area!) but this bag came pretty darn close! I've tried the microwave kind and they just never turned out quite as sweet. These hit the spot oh so well while we were roadtripping to Branson. Definitely a new favorite around here! Veggie Straws // Anyone else here a snacker? Guilty. I try not to keep much of anything in the house, but vacation called for a few treats, so I thought I'd try out these Veggie Straws instead of the usual potato chips. And they were super yummy! They don't really taste any different than a regular chip, but there's a lot less fat in each serving which I'm thankful for! And the straw shape is just kinda fun to eat (I know, I know...still a child at heart!)! *UPDATE* if you have an Aldi near you, they have a cheaper generic version of these and they are delicious! philosophy The Microdelivery Exfoliating Wash // So, my grandma actually got me hooked on this wash! Ha! She's the best. I already use the philosophy Purity face wash for makeup removal, and I started using this exfoliator afterwards. I've noticed a huge difference in my skin! I'm having less hormonal breakouts and my skin is just softer/smoother in general! Definitely a new skincare favorite! Gotta love philosophy. Munchkin Silicone Baby Feeder // Say goodbye to those messy mesh feeders! This silicone one is soo much better! I can rinse it out or even throw it in the dishwasher and nothing gets left behind or stuck in the crevices! Lucy's current favorite thing to munch on in this is chunks of watermelon! So that's my favorites! What are you loving right now? Anything I should check out?! Let me know!